The members of Radiohead say they are "appalled" that charges stemming from a fatal concert stage collapse in Toronto in 2012 were stayed. On Tuesday, a judge ruled the justice system had failed by allowing the case to take far too long to come to trial. They added it was "an insult to the memory of Scott Johnson, his parents and our crew." Johnson, a 33-year-old British drum technician, was killed on June 16, 2012, a few hours before Radiohead was set to take the stage at Downsview Park. Three others were injured. 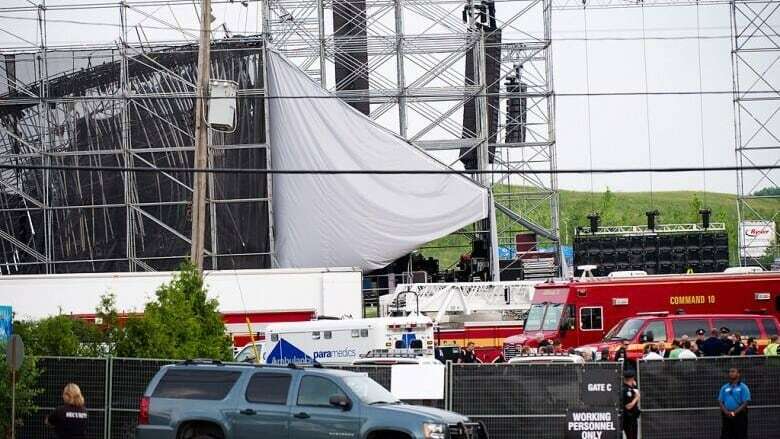 A year later, entertainment company Live Nation, engineer Domenic Cugliari and contractor Optex Staging were charged with a total of 13 offences under provincial health and safety laws. The subsequent trial was derailed when the presiding judge, Shaun Nakatsuru, declared he had lost jurisdiction given his appointment to a higher court. That decision led to a senior justice declaring a mistrial in May, and a new hearing was set to begin Monday. But Ontario court Judge Ann Nelson noted the Supreme Court of Canada has set a presumptive ceiling of 18 months for proceedings in provincial courts, and this case — which would have taken a total of almost five years to complete if it had gone to a second trial — would have lasted three times longer than that limit. "No doubt, this decision will be incomprehensible to Mr. Johnson's family, who can justifiably complain that justice has not been done," Nelson said.